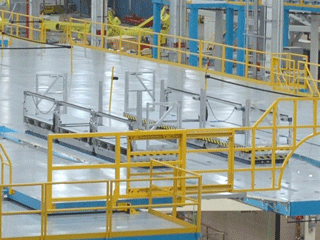 May 04, 2016 - "Innovation "
To increase the productivity throughout the fuselage assembly process, a major aircraft manufacturer needed a lightweight, telescoping, and variable-height work platform solution. First, the customer had a plank-type structure that extended into the aircraft fuselage. This structure had a limited load capacity, so any feasible lifting solution had to meet strict weight limitations. Second, the customer wanted an adjustable-height, elevated working surface that covered the entire area within the fuselage – yet be able to retract out of the way for tools and equipment that had to be pushed down a center aisle of the plank between builds. Third, because of the fuselage’s round shape, personnel guard rails needed to be adjustable – especially near the fuselage’s walls – and equipped with sensors so as to not make contact with and damage the aircraft’s aluminum structure.